Beating high freight rates still remains a challenge for most supply chains looking to stay competitive and keep cargo moving. So how can you optimize your logistics strategy without breaking the bank? 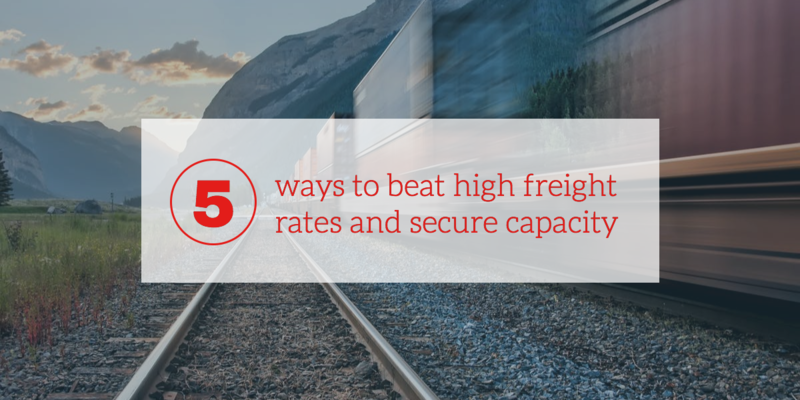 In this article, we explore five strategies to mitigate sky-high freight rates and secure more capacity. Market conditions and rates change all the time, but you can’t benefit from this information if you don’t look at the numbers. Watching spot rates trends and market maps can help supply chain managers anticipate where capacity is tight, and make informed decisions to their shipments. Databases like DAT publish metrics like truck tonnage index, fuel pricing trends, and load-to-truck ratios. Consider tracking other elements like labor trends, rate history, and seasonal changes to get a more refined picture for your analysis. These factors can help shippers plan for what and how much to import. Prioritizing shipments can offset high prices if you approach peak season with a clear forecast of what it looks like. It may seem counterintuitive to pay more money in an effort to save more money. However, investing in the right tools transforms your supply chain into a cost-saving machine. Implementing supply chain visibility helps any logistics operations increase efficiency, minimize risks, and predict threats and demand. Using logistic technologies provides you with better insights into the current state of your supply chain and helps inform your decisions for the future. Investing in technology like a good transportation management system (TMS) offers accurate monitoring and tracking throughout your transportation processes. Useful tools like an electronic data interchange (EDI) keeps drivers compliant with regulations and thus prevents costly data errors. As truck capacity tightens and rates fluctuate avoid the stresses of the freight market by weighing your options with other forms of transport. Consider combining modes of transport with truck and rail shipping. An intermodal strategy can provide you with stable pricing as well as capacity, usually by just adding a day or two to the transit. Leveraging intermodal is a good option for saving money on long (over 750 miles), repetitive routes. Have a truck shipment that will arrive on a weekend when your consignee is closed? Consider intermodal. In this capacity crunch, carriers can afford to select their shippers carefully. It’s becoming more important than ever to build trustworthy relationships with carriers. When you build better carrier relationships, you get access to better rates and chances to secure capacity. To earn the “preferred shipper” status, supply chains need to create driver-friendly ecosystems. A few thoughtful additions include offering safe facilities for drivers, communicating openly with carriers, reducing driver wait times, and paying carriers quickly and fairly. Earning a shipper-of-choice kudos is a simple way to overcome competitive prices while making yourself more attractive to carriers. Maximizing your supply chain using a third-party logistics provider (3PL) should be a high priority for any business with goods on the move. To ensure your cargo gets to the right place at the right time, partnering with an experienced 3PL can help expand your resources, secure capacity, and improve efficiency while reducing your costs in the long-term. Finding a great 3PL can be difficult, especially if you don’t know where to start. How do you pick the right one? Working closely with a 3PL is a serious decision that takes many factors into play. Choosing a 3PL with the lowest cost might be tempting, but it isn’t always the best option. Without a question, you need a reliable partner who understands your business and delivers your freight on time and in good condition. Adding a consultative advisor with a proven track record to your supply chain brings immense value to your business. At CAI Logistics, we help you innovate and improve your processes for increased efficiency, profits, and safety. Working with us means you’re working with someone who’s already implementing all the strategies mentioned above. Even in the most challenging market conditions, we have the knowledge and experience to provide a range of creative shipping strategies and build a long-term plan to save you from high costs down the road. If you’re looking for the best approach to optimize your fulfillment network in this capacity squeeze, download our free guide and get instant access to the best capacity strategies for supply chain professionals.